Sussex openers Phil Salt and Luke Wells made an impressive start to their Specsavers County Championship game against Gloucestershire before rain swept in to ruin the first day at Hove. 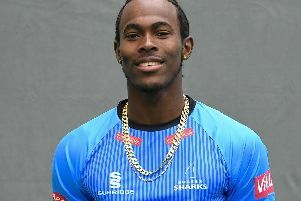 Salt, 21, was unbeaten on 54 and Wells had contributed 25 to a stand of 86 for the first wicket before rain arrived at 12.30pm. Umpires Martin Saggers and Russell Warren abandoned play at 4pm with no sign of an improvement in conditions after taking an early tea. After losing Chris Nash to Nottinghamshire during the winter Sussex are giving Salt, who is making only his tenth first-class appearance, a run as opener and although he played some false shots there was a lot to admire in his aggressive approach after Sussex had batted first following an uncontested toss. Australian Dan Worrall troubled both batsmen during a lively nine-over burst with the new ball up the slope. Salt came down the pitch to try and smear him through the off side and was then struck on the helmet by the next delivery when he misjudged a bouncer and needed to make repairs to his headgear. But in the last over before the rain arrived, Salt drove Matt Taylor for four then pulled his next ball over square leg for six. A single off the next delivery took him to his second Championship half-century from 59 balls which has included nine boundaries. Earlier, in the tenth over, he had taken three fours off Taylor with two drives through the off side and a pull to the mid-wicket rope. Wells, fresh from an unbeaten 102 on Monday in Sussex’s last match against Leicestershire, batted with more reserve but looked solid enough. His innings, from 66 balls so far, has included four boundaries. Gloucestershire, who won their opening Division Two game against Kent before losing to Glamorgan last week, used just Worrall, Taylor and Craig Miles and although Worrall in particular beat the bat on several occasions their trio of seamers could not make a breakthrough. Sussex made one change with left-arm spinner Danny Briggs making his first appearance of the season with leg-spinner Will Beer dropping out. Gloucestershire were without last year’s leading wicket-taker Liam Norwell and David Payne because of injury. Phil Salt said: "I was delighted to get to 50 and hopefully tomorrow I can push on. As a batting unit we have all got a score now and I think that is something we can be very proud of because it hasn't been easy for batsmen in the first few weeks of the season with all the bad weather around. "I try to bat positively and fortunately today I took the right options and managed to get some runs. Hopefully I can come back tomorrow and build on it. "Luke Wells, my opening partner, is a very different batsman to me and he's always in my ear reminding me what I do well and I'm always reminding him what he does well and it seems to work pretty well." Gloucestershire captain Chris Dent said: "The wicket perhaps didn't do quite as much as we expected, in fact it's a pretty good pitch. Obviously we'd have liked to have taken some wickets but credit to Sussex and especially Phil Salt, who batted very positively. "We just need to come back tomorrow, settle in, keep the run rate down and hopefully pick up some wickets."